It is getting colder in Munich, raining and snowing at the same time. It makes you not only having more appetite to crave for something but also looking forward to comfortable essence and staying at home where is warm and cozy. Moreover, hoping for a calmer and more peaceful atmosphere in life and mind. When most people complain about winter, I do enjoy and look forward to the cold days, and its holiday mood. Whenever the season enters December, it is the busy time for Europeans to start preparing for the Christmas and New Year holidays. They plan for winter vacations, and the make a gift list for the family and friends. In one evening after our dinner, we chatted about the gift list. My daughter is good at drawing and handmade, she has been starting to make the greeting cards. However, she has no idea what to write on the cards. My the other half is not good at choosing for presents. Therefore I am responsible for making the budget and picking the right gifts. It is a work that is not easy but very sweet. Depending on the person's lifestyle as a reference and looking for the perfect gifts makes me satisfying. However, we don't have any idea yet. I shall check the newest magazine issues about the editor's choices. Luckily, just in some days after our brainstorming, I received a package from 10/10 Hope, Taiwan. They sent a Christmas package and warm greetings for me. I felt the Christmas is just right on the corner as I opened the gift pack. Moreover, the gifting idea inspired me. 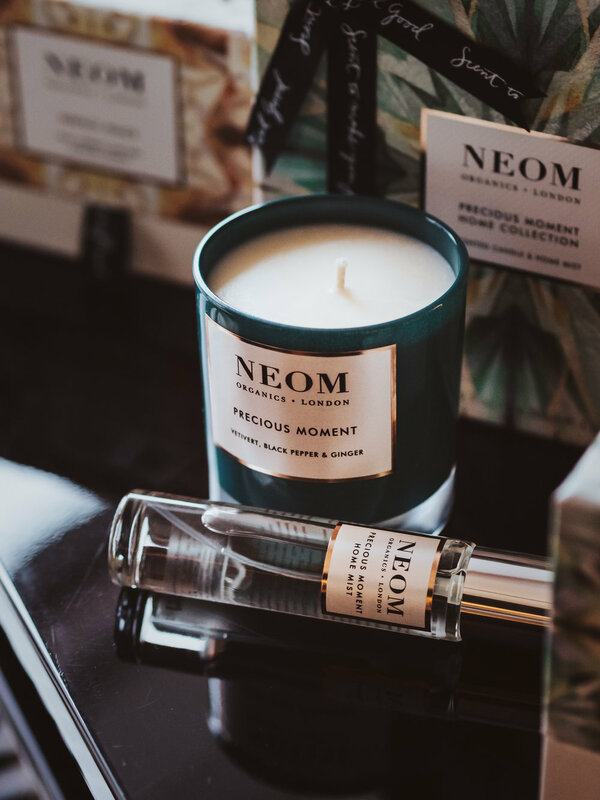 In the package are the NEON newest Christmas candle collection, Precious Moment and Perfect Peace gift boxes. Holding the beautiful boxes makes you full of joy. The Precious Moment Scented Candle is a fresh and vibrant blend of 21 pure essential oils, including vetivert, black pepper, and ginger as the vital ingredients. The smell is smooth and calm which uplifts the mood. I did not light on the candles until the product photos are taken. However, just put the candles on the cupboard, the small corner has been fragrant and charming. I thought the Precious Moment Scent already caught my heart until I open the box of the Perfect Peace Scented Candle. The Perfect Peace fragrance is a bright blend of 25 essential oils including pine, myrrh and lime peel as the primary elements. It makes the room with its bright and uplifting festive aroma. 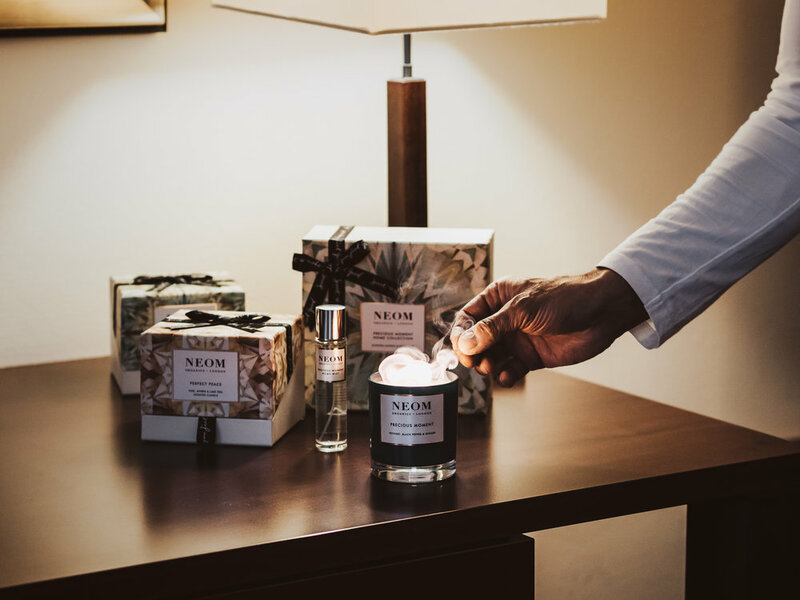 I might light the Precious Moment Scent candle when I am alone, but the Perfect Peace Scent is definitely for gathering with friends and family. 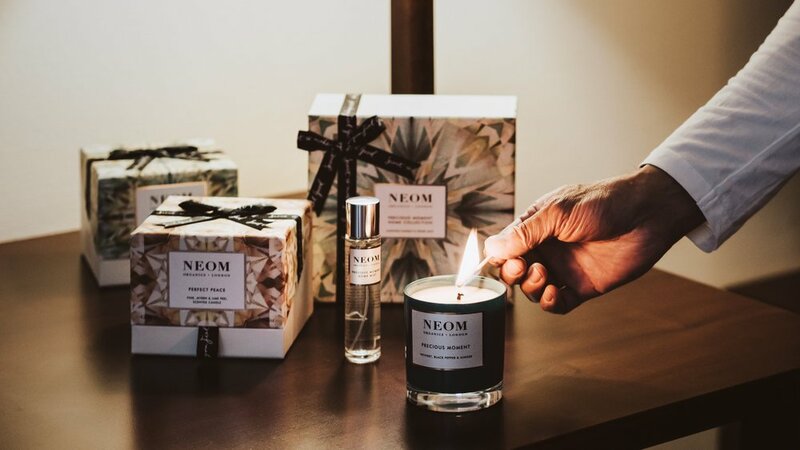 In NEOM's fragrance series, the most reassuring is the formula of pure essential oil. If the quality is not good, not only is it bad for the body but the purpose of relaxing healing through respiratory therapy is lost. 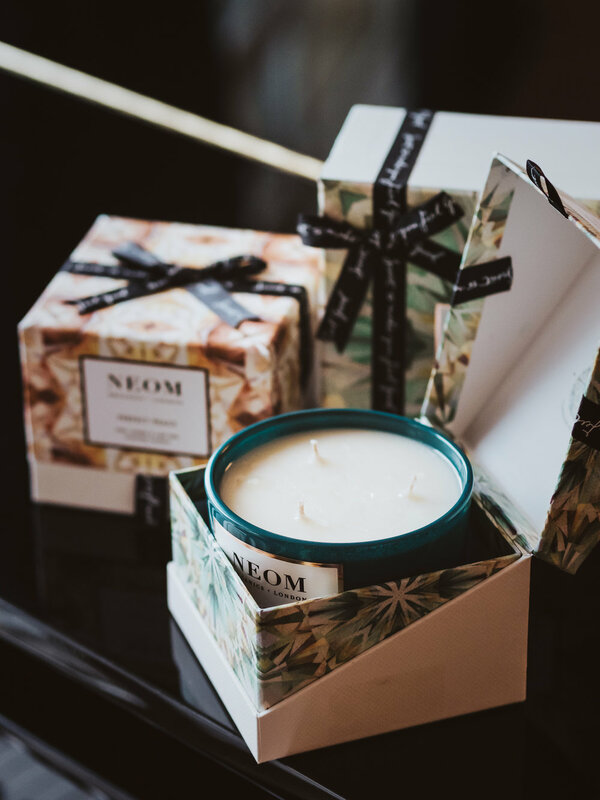 Moreover, a large size of a NEOM candle has three wicks which avoid a tunnel after some hours burning, a better quality design. 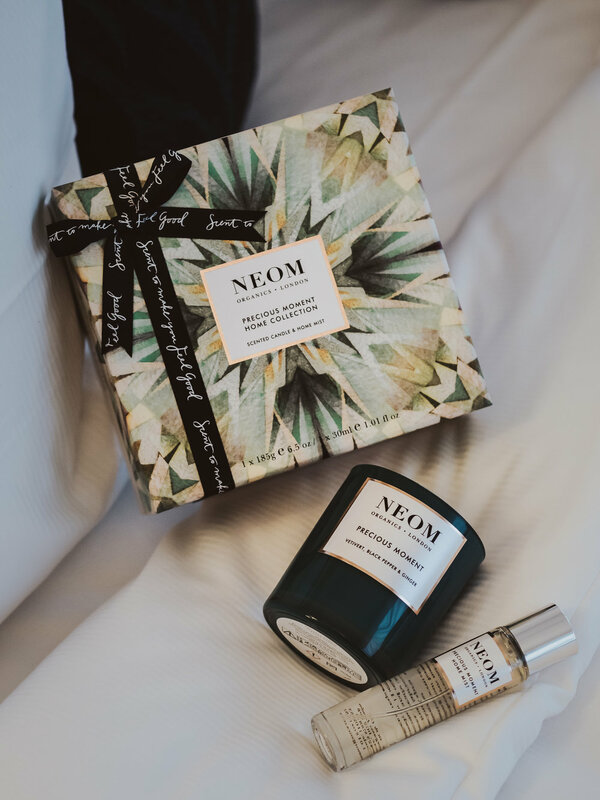 After our photo shooting in an SPA hotel in the suburbs of Munich, my the other half suggested that we could choose the NEOM Christmas collection as gifts for this year. Meanwhile, I was laying down on the sofa after our SPA treatment. Beside me, there was the Precious Moment Scented candle on the small coffee table next to me. I smiled at him and nodded my head to agree. I plan to order the Christmas Wish collection for my parents in law. The traditional and fabulous Christmas smell is just excellent for them. My mother in law who always has good taste, I know she is going to love it. The Precious Moment home collection is perfect for my sister-in-law. I could imagine when they light on the candle meanwhile burning the fireplace at the same time in the living room. Besides, I will order the Perfect Peace candle collection for some of our close friends, no better ideas than it.